I like there to be a warm and congenial relationship among the members of the church staff where I am interim minister with no one taking themselves far too seriously and with an atmosphere with some humor and lightness. I have experience helping congregations with substantial administrative and financial issues. I was the settled minister in Springfield, IL and in Decatur, IL when these Unitarian Universalist congregations had successful capital campaigns, bought land, and then built their current buildings. I was minister on staff in Peoria, IL when that Unitarian Universalist congregation had successful capital campaign, bought land and built their current building. Financial issues are the most obvious -- and often the most difficult administrative issues for Unitarian Universalist congregations to address in public. I see my main role in the area of stewardship as helping and inspiring congregation members to see the spiritual side of giving, to see that what we do with money does reflect our ultimate concerns, and to help them become more comfortable in speaking about the subject. Keeping myself informed of the overall financial situation of the congregation, and having a general idea of the policies and procedures in this corner of congregation life (and helping to facilitate people following them) are also things I enjoy. I want to offer support to the volunteers and staff members who work with these concerns and help them to be effective -- and to get out of their way so that they can carry out their tasks. In particular I like to help lay leaders to facilitate many members of the congregation owning and "building" the annual budget together -- preferably a program-based budget -- before the annual canvass. I sometimes am called upon to provide special expertise and to draw on my experience I have regarding capital campaigns, endowment funds, and encouraging folks to remember the congregation in their will. 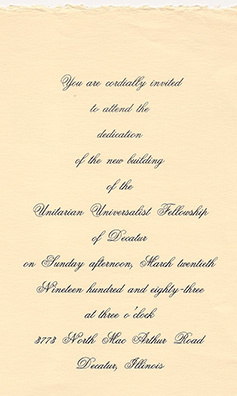 I also help make connections between the congregation and people within the broader Unitarian Universalist movement who specialize in these areas.